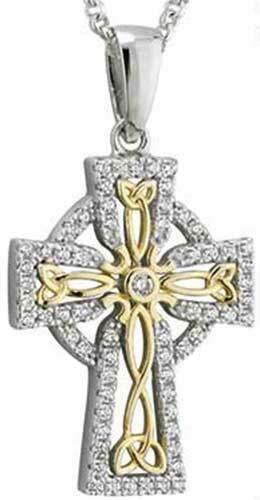 Sterling silver Celtic cross pendant features gold plated filigree knot-work along with crystals. This Celtic cross necklace has been hallmarked by the Irish Assay Office at Dublin Castle in Ireland. This sterling silver Celtic cross necklace features gold plated Trinity knots and is enhanced with crystals surrounding the outline with one larger crystal in the center. The feminine Celtic cross pendant features a dimensional but hollow design and measures 5/8” wide x 1 1/8“ tall, including the jump ring and the chain bail. 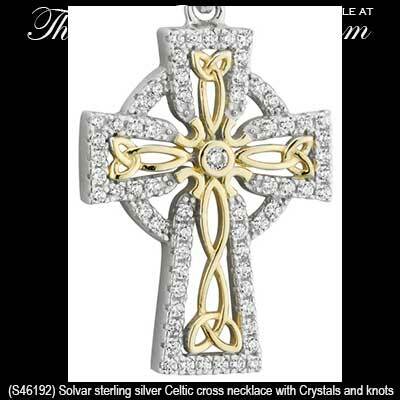 The Celtic cross is complete with an 18" long sterling silver chain. This Irish necklace is gift boxed with Celtic cross and Celtic knot history cards, complements of The Irish Gift House. 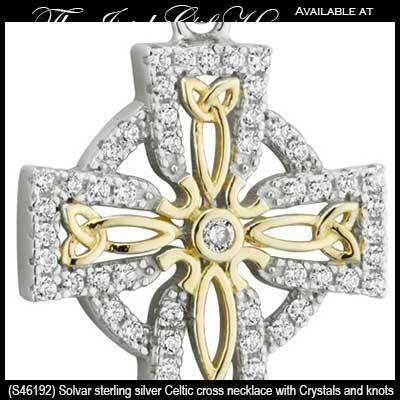 The sterling silver Celtic cross is part of the Fáilte Collection, made by Solvar Jewelry in Dublin, Ireland. The Solvar Fáilte Collection offers heavier Irish jewelry and the necklaces feature thicker chains. Celtic cross necklace is cast in sterling silver and features the Claddagh prominently in the center and is enhanced with filigree knot-work. Sterling silver Celtic cross necklace is enhanced with marcasite stones and a green crystal in the center. Sterling silver Celtic cross pendant features filigree knot-work along with crystals. Sterling silver Celtic cross pendant features a lab created emerald in the center along with CZ stone accenting. Sterling Silver Celtic cross is enhanced with a synthetic emerald in the center along with crystals in the knot-work design.